Welcome back from Pyeongchang, not Pyeongyang, which I am finding out is a completely different place without so many happy cartoon characters walking around. From what I understand, it still has cartoon characters; they just aren’t that happy. And I need to start off this day by apologizing about the name of the cartoon characters around here. Yesterday, I called the white tiger by the name, Bandabi, and this is not correct. His name is Soohorang, which comes from the word, Sooho, which means protection. He is the official mascot of the 2018 Winter Games as I have been told due to my mistake yesterday. Bandabi is the name of the bear, and he is the official mascot of the 2018 Para-Olympic Games which will take place in two weeks at the same locations. I don’t know what his name means, but I am sure that as I am posting this, somebody will explain it to me tomorrow. For those who don’t know, the tiger is a very important symbol in Korea. 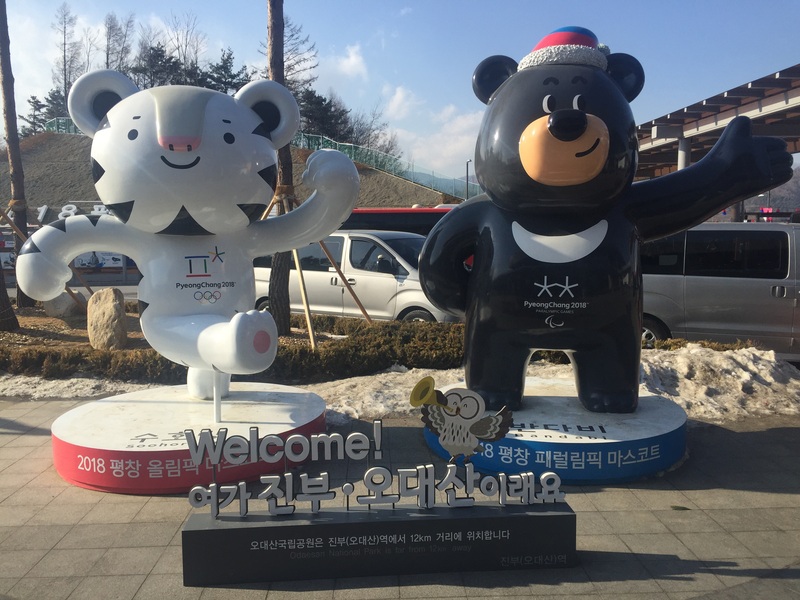 Its image is all over the place, much like Soohorang is all over Pyeongchang. 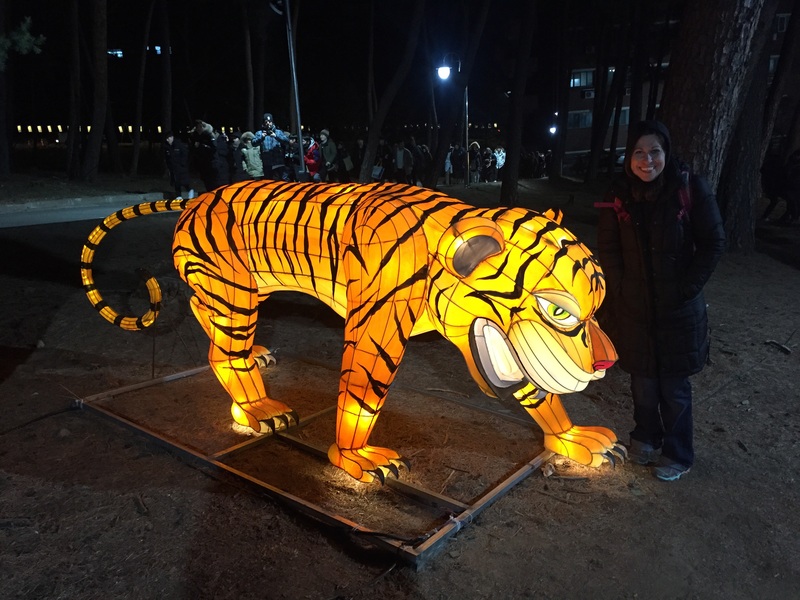 Many Koreans believe that Korea started from a tiger, and if you look closely at the shape of Korea, you can see the shape of a tiger. I can imagine a lot of you googling the map of Korea right now to see if this is the case, and it might be hard to see. I have actually had to have my students draw it out for me before I was able to see it. 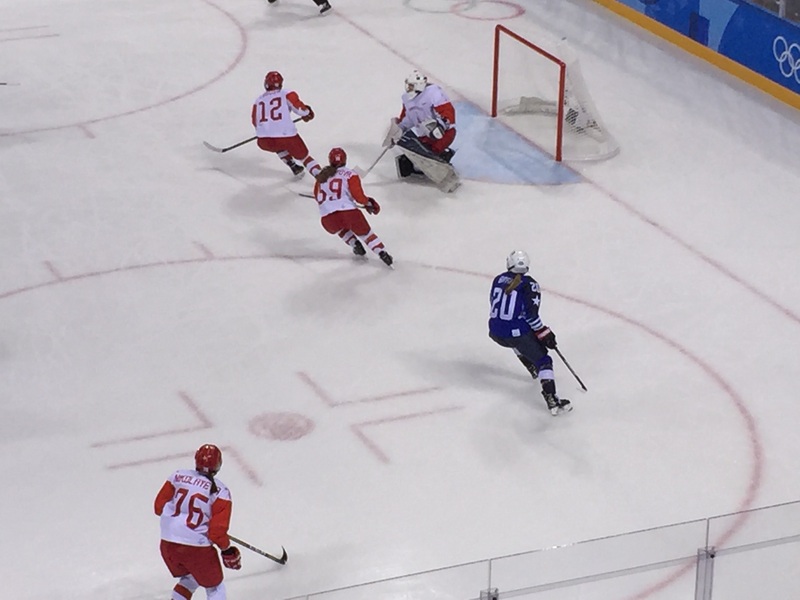 When I wasn’t thinking about tigers during my second day out at the Winter Olympics, I was going to a different location than where I was on the first day to attend a women’s hockey game, and this time, one of the teams was the team I was the most excited to see, the U.S.A. They were playing the team that we are supposed to pretend is not Russia, and I was super excited about this moment. I had watched Miracle a couple of weeks ago and this was reminding me of that historic game, except for the fact that it was women playing this time, and that it wasn’t really much of a competition. In fact, the U.S.A. killed those people without a country from Russia. The final ended up being 5 to 0, and the really indication how lopsided this game was happened when I looked at the shots on goal. The U.S. had over 51 shots on goal, compared to that other team who was wearing red and usually lived in the country known as Russia who only had 11. In fact the puck was hardly ever over on the United States side of the ice. Even though the game was a blowout, it didn’t mean that I still couldn’t have fun at it. First off, it is always nice when your team wins. But there was enough entertainment going on to make the game just as fun. A band from the Netherlands showed up to play a few tunes. 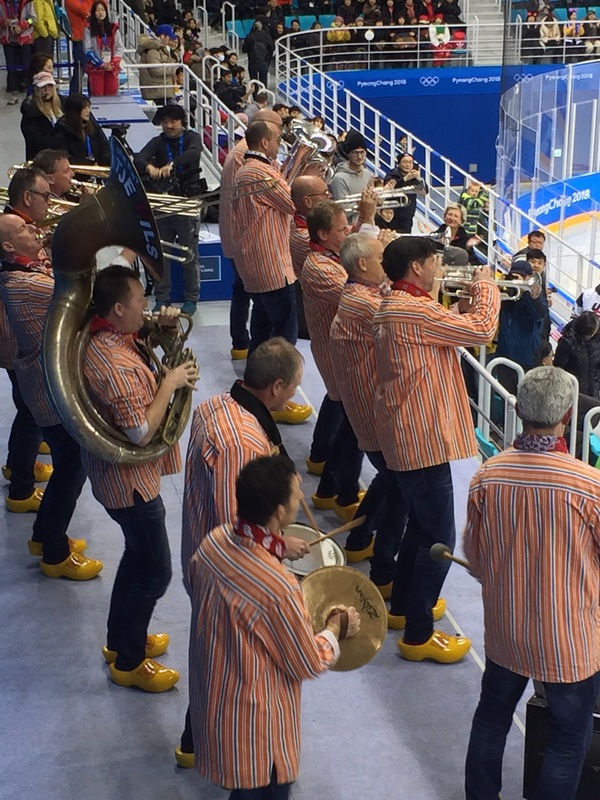 Apparently this same band has played at the Winter Olympics for the past thirty years, and they really got the audience pumped up before the action. Also being at a sporting event in Korea means that there has to be cheerleaders. 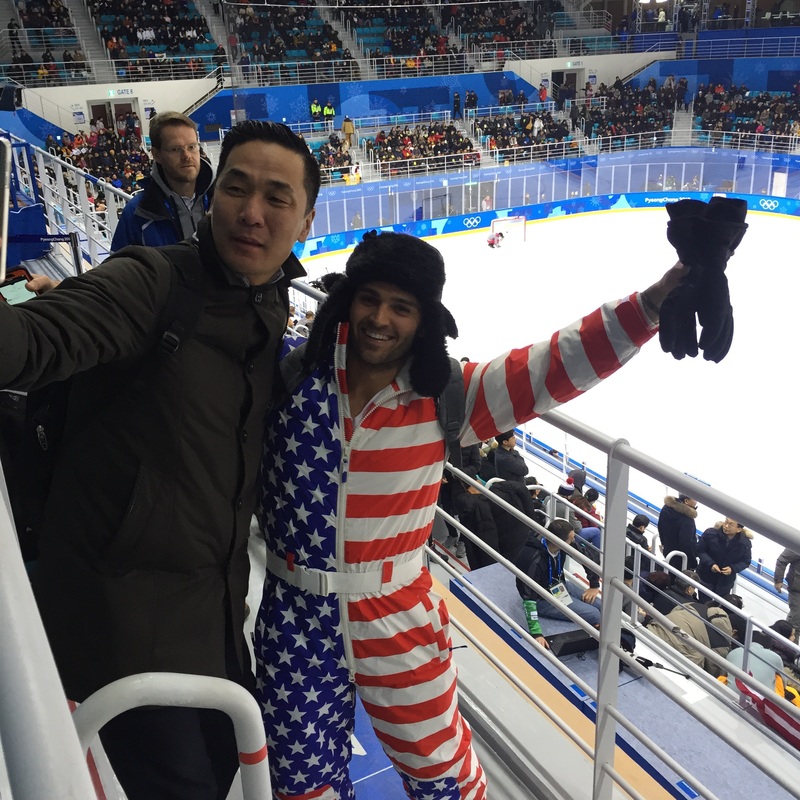 They also worked hard at pumping up the crowd while remaining neutral to the events taking place on the ice. I know there are a couple of teams in the NHL that also employ cheerleaders, but it is just weird to see them at a hockey game. But then again while I have been living in Korea, I have seen them at baseball games which is even weirder. And it is not like if they weren’t there that I still wouldn’t have seen strange people wandering the crowd. This is probably the best part of the Olympics. People from all over the world come together to watch sporting events decked out in gear that shows what country they are from. I have never seen so many people wearing the American flag, and they weren’t the only ones here like it. I saw people dressed in Swiss gear, Canadian gear, and waving the unification flag for Korea out here. I even saw people wearing the Russian flag which I don’t understand why because they aren’t even at these Olympics.